When I bake my favourite Chocolate Cupcake recipe, I’m always left with a huge amount of leftover buttermilk and no real idea what to do with it. Often enough, it ends up going to waste. But I’m feeling a real thrifty phase coming on, and I’ve been watching BBC’s Foyle’s War and thinking about rationing and self-sufficiency and all that, and while not wasting a little buttermilk is really a small thing, it feels good. And a bellyful of delicious, light, fluffy pancakes feels pretty damned good too. I always think of pancakes as being heavy, boring, and a bit of a hassle to make, but these Buttermilk Pancakes are quick and easy and pretty good even without maple syrup. I bet they’d be great with honey, too, or with a little lemon juice and icing sugar. In a bowl, beat the eggs until they’re sort-of frothy. Add the flour, sugar, baking powder, baking soda and salt, and beat on just until blended. Don’t worry about leaving a few lumps in the batter! Heat a frying pan to a medium-high. Pour about 3 tablespoons of the batter into the frying pan for each pancake. Cook until the tops of the pancakes are covered with tiny bubbles and the batter is set, about 4-6 minutes. 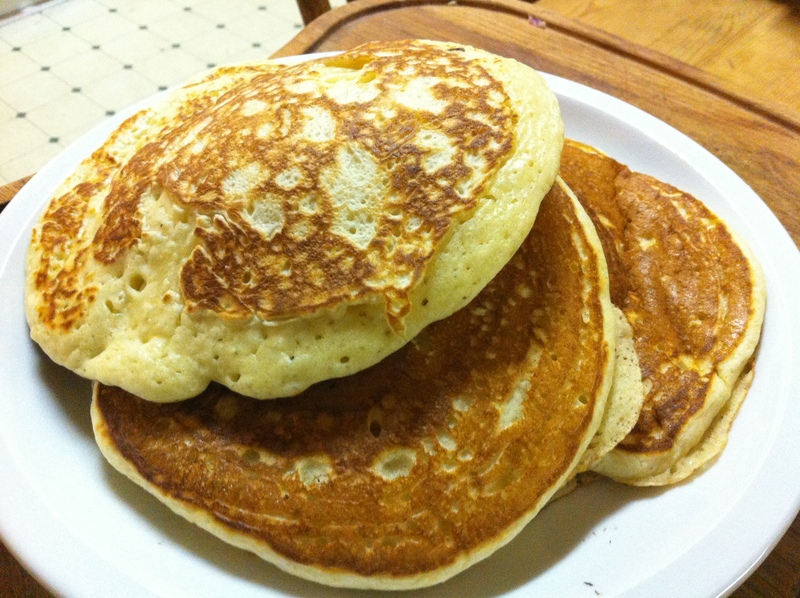 Flip pancakes and cook until the undersides are golden brown, about 4 minutes more. Adjust heat as necessary.